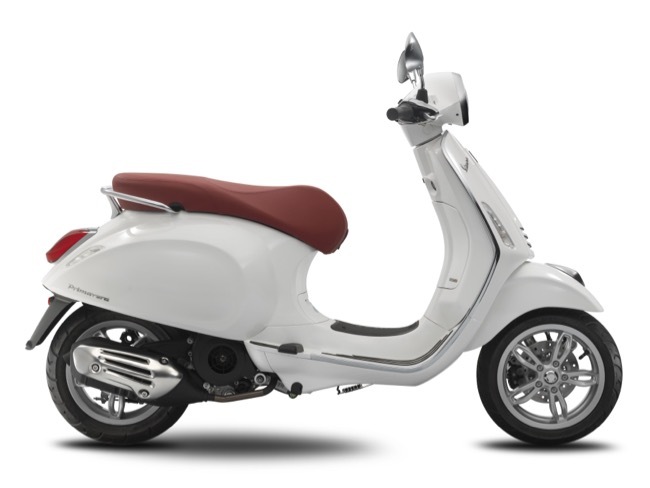 Vespa have realeased exciting new versions of their popular Sprint and Primavera modelswith a range of technical updates to include ABS and improved efficiency. Once again, Vespa confirms dedication to cutting-edge technology proving to be one of the most modern and safest vehicles in the world with the introduction of improved versions of Vespa Primavera and Vespa Sprint; 2 models which are heirs to the legendary “Vespino” that have charmed and transported entire generations worldwide. Increased specification now includes the most significant upgrade to ABS standard on all 125 and 150 cc versions of Primavera and Sprint. Additional innovation comes in the form of the upgraded Piaggio i-get powerplant, capable of ensuring brilliant performance, reduced consumption and extremely high overall efficiency. A USB port is now fitted in the glove compartment and electric saddle release is a new and handy improvement while the Primavera features larger 12” diameter wheels with new spoke design. An electronic, single channel ABS braking system is now standard on Sprint and Primavera 125 and 150cc models, a technical advancement designed to increase safety. The ABS system, developed specifically for the Vespa Primavera and Vespa Sprint, is extremely compact leaving the kerb weight virtually unchanged. The advantages of ABS are tangible in terms of safety and riding confidence on the road, where riders will discover Sprint and Primavera offer dynamic qualities and exceptional stability; something learners in particular will fully appreciate. Upgraded Italian Green Experience Technology (i-Get) engine: maximum quality and reliability. 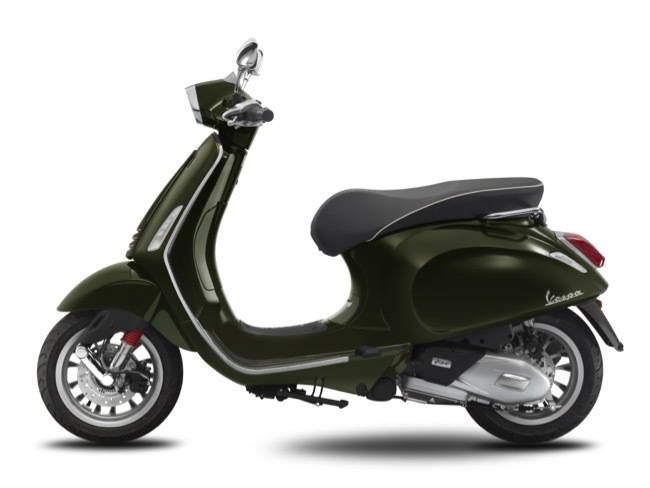 Vespa Primavera and Vespa Sprint i-Get power plants are single cylinder engines, completely new both in terms of mechanical components and electronic parts. The upgraded power plants are the result of a design philosophy that sets new and more advanced quality and reliability levels as its primary objectives. Every aspect of the design process was aimed at increasing the efficiency of each individual component, thereby working together to maximise performance and minimise consumption and emissions (not only polluting emissions but also sound emissions). With a testing phase of more than one million kilometres, the new i-Get engine is a testament to the attention to quality and reliability in the development process. the crankshaft, with 24% increased inertia compared with the previous engine for a decisive reduction in vibrations and a smoother ride. A new starter motor, decidedly quieter. A new gearbox cover, to reduce the noise even more and increase strength. New exhaust system makes the engine quieter and at the same time ensures a pleasant sound. 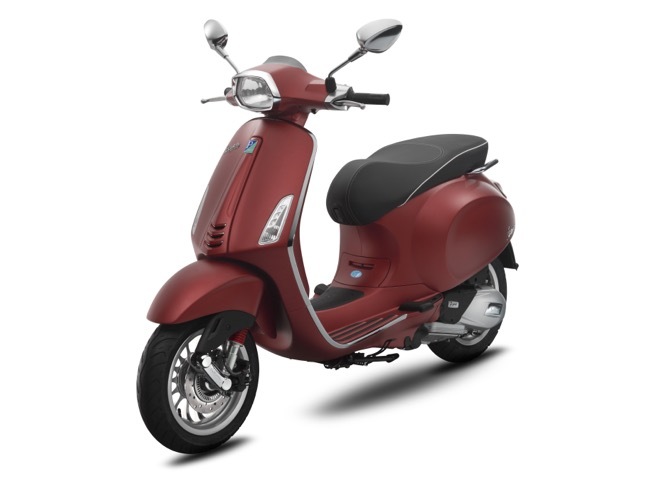 The i-Get power plants that equips Vespa Primavera and Vespa Sprint are ultra-modern, single cylinder 4-stroke 125 and 150 cc air cooled engines with electronic injection and 3-valve timing. Each and every detail, from the exhaust to the internal design of the gearbox cover, has been designed to make the ride smoother, quieter and more comfortable. The injection system has been optimised and improved in terms of efficiency and the result is an engine which is environmentally friendly and capable of performance at the top of the category. The i-get 125 cc and 150cc engines both feature improved power and torque. 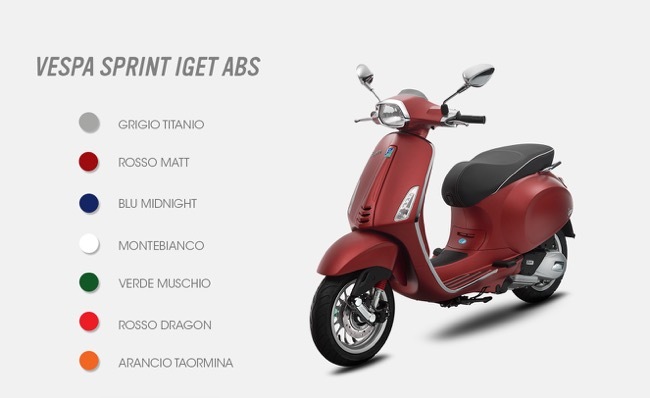 The Vespa Sprint in 150 cc will be available in 3 new colours: Grigio Titanio, Rosso Matt and Verde Muschio while the current colours of Rosso Dragon, Montebianco, and Blue Midnight are retained. All Sprints are fitted with a black saddle. A wide range of accessories to customise your vehicle and improve riding comfort are also available. The Primavera top box in matching colour is available and can also be fitted with a matching back rest to colour coordinated to the seat. A high quality, methacrylate windscreen, tall or low design and customised with the Vespa logo is also available. Chrome front and rear luggage racks with laser engraved Vespa logo are a popular choice for the tourer and one of the most classic accessories. Chrome perimeter kits, floor mats and covers are also available as are electronic alarms and mechanical cable anti theft items. 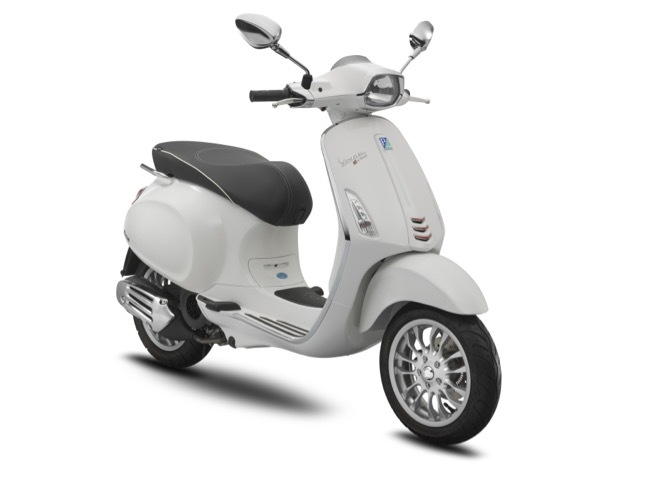 Primavera & Sprint ABS are available now at Authorised Vespa dealers. *MLP does not include on road costs which are additional costs for registration and dealer handling applicable in each state.